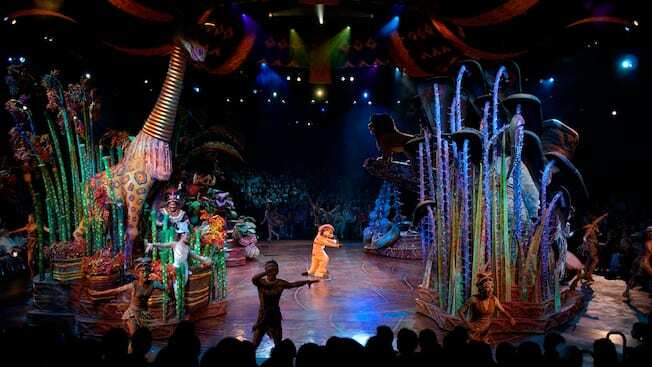 All the action on the round stage is centered on the musical re-telling of the story of Simba, Nala and Scar—for The Lion King himself. Sing along to “Hakuna Matata” and other favorite songs while Simba struggles to take his rightful place as ruler over the Pride Lands. Dance and aerial performances highlight the entire African jungle-set show experience with “animal” choreography. As Simba finds the courage to challenge Scar and his hyenas, the thrills build to a climax featuring magical special effects and fire dancers who literally light up the stage.